« A Visit From Thor – Let’s Cowboy Up! Kathy – I know that is exactly what happened to me. I was so engrossed, I mean totally engrossed in making my book better, that my brain was just pooped by Sunday afternoon. The only things I could think to write about were related to my book and I didn’t feel like blogging about that since I’d just spent hours re-writing it. Thanks for your encouragement and support. I know this too will pass, but yesterday, my mind was an empty canvas. Well, except for those ideas for Christmas. I need to get to the dollar store and stock up on glue sticks and supplies. I’m so with you, sister! After spending most of the year dealing with this mystery illness, sometimes I’ve simply got nothing left at the end of the day. 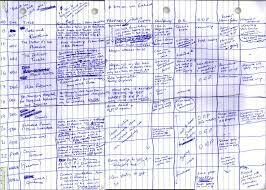 I was totally hoping that budget sheet was a nifty way to plot out my next novel! Darn it. But you know, tips on budgeting work, too. 🙂 I think I need to budget my creative time as well. I’ve lost my momentum on reading (books as well as blogs), but today I promised myself I’d spend some time doing things I enjoy. Not just things I ‘have’ to get done. And look, here I am! But now I’m sad because I finally make it here and you’re going on vacation. Well, maybe I’ll sneak into your suitcase and travel along with you. Oh, Tameri, I’m so sorry to hear that you haven’t been well. Mysterious illnesses are bothersome and frustrating. I’m glad you made the effort today, though, because I so enjoy seeing your smiling face at my blog. Actually, I’m not going on vacation again until March. Yesterday I just took a little cyber stroll to paradise because that about all the mental energy I could muster after hours of painstakingly ripping the guts out of my book. Eureka! I get to give you a word of the day. Or at least that’s what that blankness signifies to me. Shame on you, Colleen. Sounds like you were just waiting for me to screw up so you could show off your afflatus. Actually, I did look up a word, I guess I must have forgotten to hit the “update” button when I inserted it into my post. It’s just as well that I left it blank. Shows how truly uninspired I was yesterday afternoon. P.S. – Did you get your last blog prize? I figured you left it blank to illustrate your need for inspiration. Hope you and inspiration find each other soon! I re-sent it. It went to colleen@colleenpatrick.com. Let me know if and when you get it. Got it! Thanks so much for the prize, Patricia. 🙂 Much appreciated. My creative juices sort of dried up yesterday. I am usually ready to get to work after a chapter meeting, but maybe it is looking around at the mess I have created downsizing. Nothing seems to come to mind in writing an epilogue or finishing my fifth story. I think I will go cook something for a while and try to hide from the empty pages I need to fill. As far as where would I like to be – you know I will always pick Scotland. I know they are having a bad storm over there right now, but the dreams still come. Good morning my Dear. Saturday’s chapter meeting and board meeting were exhausting. We got a lot accomplished and have a clearer picture of where we’re going next year, but it was exhausting. And moving is not fun. It’s exciting to be going someplace new, but the packing and cleaning and getting rid of stuff is almost overwhelming. Especially when you have so many years of accumulated stuff. I feel your pain. Just keep thinking of Scotland while you pack. Maybe that’ll help. You know you’re ready for a vacation when you actually look forward to having surgery just so you get some time off 🙂 But seriously, I know just how you feel. I seem to have just enough energy to do some things, but not everything I want to do these days. But I’m okay with that. I figure my body is trying to tell me something when I go through times like this. In your case, your body is trying to tell you something. You’ve been through some serious physical trauma so you need lots of energy to heal, which is what you should be focusing on. It was good to see you Saturday. I hope your family situation improves. Nothing like more worry and stress to add more worry and stress to your already stressful situation. Hi Karen. As usual, you have nothing but kind words or encouragement. Yes, it’s my fourth book, but I can’t seem to get it right enough to get it published. One of these days. I like blogging, I just get brain overload and can’t seem to find anything fun to blog about sometimes. Thanks for stopping by. Always nice to see your beautiful face. And yes, I wish I was in a position to take vacation every other month. Wouldn’t that be fun? Lots of places I’d rather be than at work, but at least here I’m making money and not spending it. 🙂 More vacation would be nice, though! I hardly ever have much creativity left for blogging. Research has given me some fun facts, but witty & clever? Not happening! I’m with you on the witty and clever stuff. Sometimes it’s there and sometimes it’s MIA. I’m glad I’m not the only one who goes through these funks. Good to see you here at the Edge of Eternity.